It's the end of the month. You know what that means... time for our monthly Bad Girl Knit Night: The Halloween Edition! Join us this Friday, October 26 from 6:00-9:00 PM (or so) for a night filled with food, fun, yarn and Halloween treats. We'll also have a sneak preview of our Made With Love Trunk Show featuring yarns from South West Trading Company's Vickie Howell Collection. As always, Bad Girl Knit Night is a potluck affair, so bring your fave witches brew, scary dish, or Halloween treat to share. And if you wear a costume to the party, we'll give you a 15% discount on your purchases for the evening! With a new shipment of Brittany needles and some new yarn in stock, it's like having your own private mini-sale. And by the way, there will be a prize for best costume. 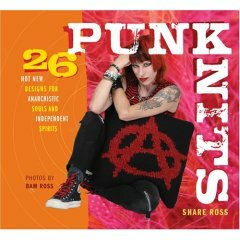 In Punk Knits, rocker/knitter/author Share Ross shares her passion and unorthodox approach to knitting with 26 eclectic designs that draw their inspiration from the independent spirit of rock 'n' roll legends like Sid Vicious, Debbie Harry, Patti Smith, and the New York Dolls. This FRIDAY, APRIL 27 from 6:00-9:00pm, Share joins the Bad Girl Knitting Night Crew to tell us more about the creative process, sign a few books and gives us a mini trunk show featuring the punk-inspired projects featured in her book. And because it's Bad Girl Knitting Night, you know what to do. Bring a bottle of your favorite wine to share. Remember - you must be 21 or over to share a glass of wine with us. We'll have a few nibbles on hand, but feel free to bring snacks. Bad Girl's Knitting Night Returns! 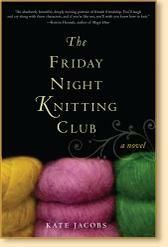 Kate Jacobs, author of The Friday Night Knitting Club, will join us for the next installment of Bad Girl's Knitting Night! Mark your calendars and save the date for Wednesday, April 4 from 6-9pm. Kate will be reading and signing books - which will be available for purchase at the shop. Contact us to pre-order your books asap.